1150s. RAF Regiment shoulder titles. Subdued [black/olive]. Pair. 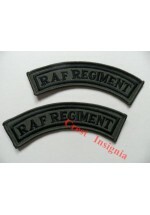 'RAF REGIMENT' subdued [black/olive] shoulder titles, for working dress. x 1 pair  Colour ver..
1151 RAF Parachute Instructor Brevet badge. Royal Air Force, Parachute Instructor's 1/2 Brevet qualification badge. ..
Royal Air Force Albatross/Eagle arm badges. facing pair. ..
1155 Royal Air Force, Pilots Wings. Colour. 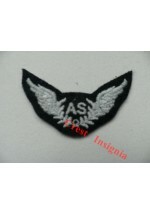 Royal Air Force, qualified Pilot Wings. Colour. ..
Royal Air Force TRF [tactical recognition flash]. ..
1157s RAF name title. Subdued. Royal Air Force, name title, subdued. For combat dress. ..
1158 'Air Cadets' jacket name title. Subdued. 'AIR CADETS' subdued [black/olive] jacket title, for working dress. 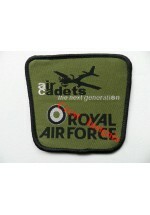 ..
1159 'Air Cadets, The future' woven patch. 'Air Cadets, the future' arm badge. ..
1173as RAF Air Steward wings. Royal Air Force, 'AS' [air steward wings]. Now redundant, replaced by the 'CC' [cabin crew] wings..